Heaven's Echoes is made up of ordinary people God has called to do an extraordinary work for Him here on this Earth!! This group began ministering as a Southern Gospel Quartet in 1983, based out of Plumerville, Arkansas. The group consist of family members raised up in Christian homes by God fearing, Bible believing parents who attended country churches where the Word of God was proclaimed! Each member, having made a profession of faith, chose to continue this Godly legacy. This foundation has stood firm through the years, and provided solid grounding in the principles of God's word for Heaven's Echoes as they continue their journey of service and obedience to the Lord. 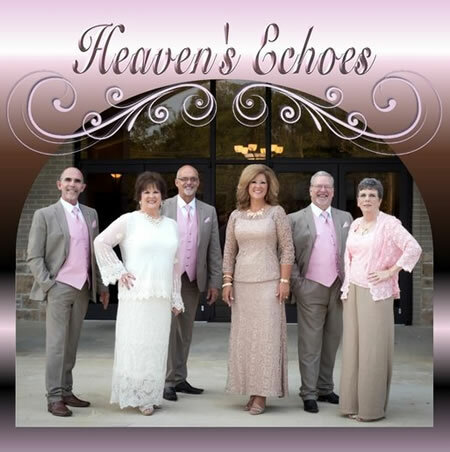 If you would like to have Heaven's Echoes for a concert at your church or other venue you may contact the group using the booking information above. For additional information about Heaven's Echoes, click here. Gus and Judy Biggers have been married for 33 years and make their home in Springfield, Arkansas. They have three beautiful daughters, two they hold on this earth and one God holds in Heaven. They also answer to Pop and Juju to two wonderful grandchildren. Gus is the Sound Technician for the group and joins them with touching renditions of songs promising a movement in your heart and soul. Judy fills the lead vocal in Heaven's Echoes and is sure to motivate all with encouragement from God's Word and her contagious energy. Together, they joyfully share Kayla Jo's story of living life.. and living death.. to inspire all those who experience love and earthly loss and restore to all the Promise of the Faithfulness of God!! They are members of Mt. Pleasant Missionary Baptist Church in Plumerville, Arkansas. Dwayne and Debbie Ward have been married for 39 glorious years and live in Jacksonville, Arkansas. They have two lovely children and three beautiful grandchildren. Having grown up the son of a Baptist Deacon, Dwayne was taught early in life about the Love of God and this love sustained him through a 49-week battle with colon cancer. To God be the Glory for Divine healing. Dwayne is sure to awaken a deeper love for Jesus inside the believer with his tenor vocals and uplifting spirit. Debbie is an anchor for the group with her outstanding alto vocal and has a heart and passion to share the love of Jesus with all she meets. She is a true warrior for Christ through every aspect of her life. Be sure to meet Debbie, whether on the platform, in the pew, or at the product table. They are members of Central Baptist Church in North Little Rock, Arkansas. Steve and Vickie Williams are the newest members of Heaven's Echoes and have been married 34 years. They reside in Alexandria, Arkansas. They are the proud parents of three sons and grandparents to eight precious grandchildren!! Son of Gerald Williams, Steve grew up in the Southern Gospel music industry and began his singing career at the age of 16 singing lead with The Melody Boys. Father and son share 100 years (Gerald 64 yrs. & Steve 36 yrs.) combined experience in Southern Gospel Ministry! Get ready to be energized by his low down bass voice. Vickie is a loving and devoted wife, Mom, friend, and dedicated member of Heaven's Echoes. You will find her ready to assist you in any way possible, from help with the products, to a listening ear with a tender heart and a prayerful spirit of service. They are members of Geyer Springs First Baptist Church in Little Rock, Arkansas. It is with great joy and honor that the members of Heaven's Echoes commit themselves to the service of God. They pray God will use His ministry to bring lost souls to the saving Grace of Jesus Christ, and their greatest desire is to forever bring Honor and Glory to the King of Kings and the Lord of Lords!!! The group asks you to pray for Heaven's Echoes as they continue the journey God has set before them. They commit to pray for each of you as you seek Divine direction on the journey that God has set before you. As one group member put it, "May we all be Passionate in our service to God...while there is still time!"